Josef Ulrich Danhauser (Austrian, 1780–1829), Settee , ca. 1815. Mahogany veneer, gilding, reconstructed upholstery, 44 1/2 x 84 1/4 x 26 in. Milwaukee Art Museum, Gift of René von Schleinitz Memorial Fund, by exchange. Photo by John R. Glembin. In 2006, when the Milwaukee Art Museum organized the exhibition Biedermeier: The Invention of Simplicity, it established itself as a center of study for the Beidermeier style that was popular in Central and Northern Europe from about 1815 to 1835. Building upon the Museum’s strength in German and Austrian art—partly due to the ethnic background of Milwaukee—the exhibition brought to the spotlight to Biedermeier art. This period of art and design history was not only little-known in the United States, but the exhibition also proposed a whole new interpretation of the style that changed scholarship in Europe as well. You can read more about Biedermeier here in this review from the New York Times. Or better yet, read the exhibition catalogue, available for purchase on the Museum Store site. The exhibition was so important that the Louvre in Paris hosted a version of it, and purchased their first pieces of Biedermeier furniture from it. You can see one of the chairs here on their collection website. In the years before the exhibition opened, the Milwaukee Art Museum made a number of major acquisitions of Biedermeier furniture because the Collection previously had none. It was a “gap” in our 19th-century Central European collection. One of the objects the Museum purchased for the Collection is a settee, which is currently on view in Gallery #9 with other works of 19th-century German art. This artwork is a great starting point for a look at the Biedermeier style, and an interesting case study in how international exhibitions can lead to more discoveries. Possibly Berlin, Germany, Long Case Clock, ca. 1820. Poplar burr veneer, ebonized pear, 82 x 23 1/2 x 8 1/2 in. Milwaukee Art Museum, Gift of René von Schleinitz Memorial Fund, by exchange. Photo credit John R. Glembin. The settee, from around 1815, is early Biedermeier. 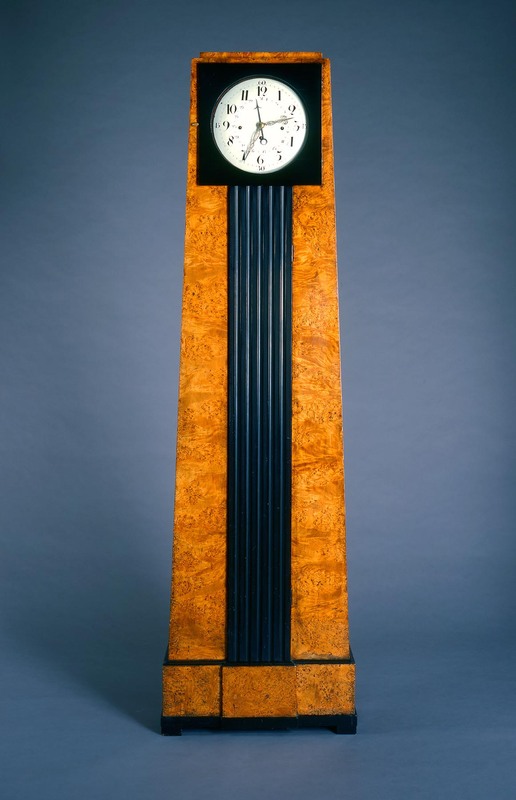 You can tell that it’s an early piece of Biedermeier because it is transitional, meaning it displays elements from what came before and elements of what came after. During the early 19th century, when the Museum’s settee was made, a late neoclassical style was used for official government rooms across Europe. This was the highly ornate style often called “French Empire,” exemplified in this chair made for the Reception Room of the Prinz Karl Palais in Berlin in the collection at the Metropolitan Museum of Art. The drapery and fringe on our settee is clearly influenced by this type of French Empire style. The exhibition explores how the Biedermeier style was popular during the same time as the Empire style, but in contrast it was favored for private, domestic use rather than public, formal use. So, then, if so many of the details on our ca. 1815 settee are Empire, what is Biedermeier about it? The shape says it all. 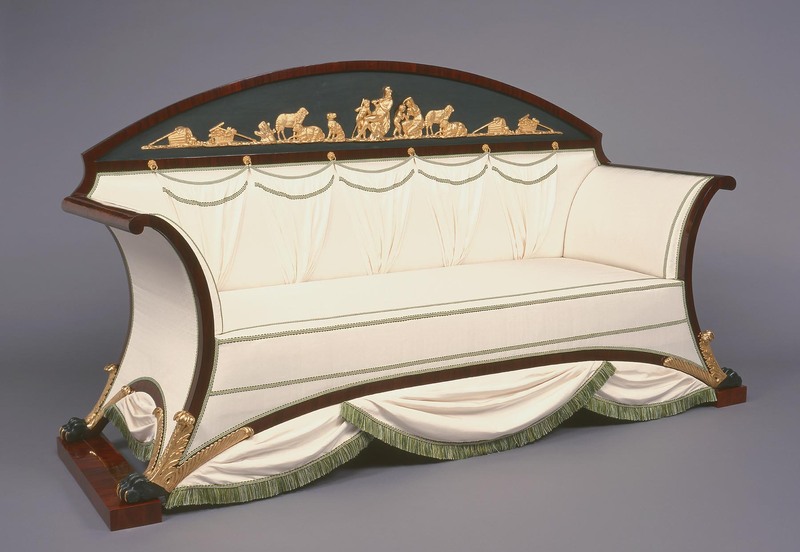 Josef Ulrich Danhauser (Vienna, Austria, 1780–1829), manufactured by Danhauser’sche Möbelfabrik (Vienna, Austria, 1804–1839), Settee , ca. 1815. 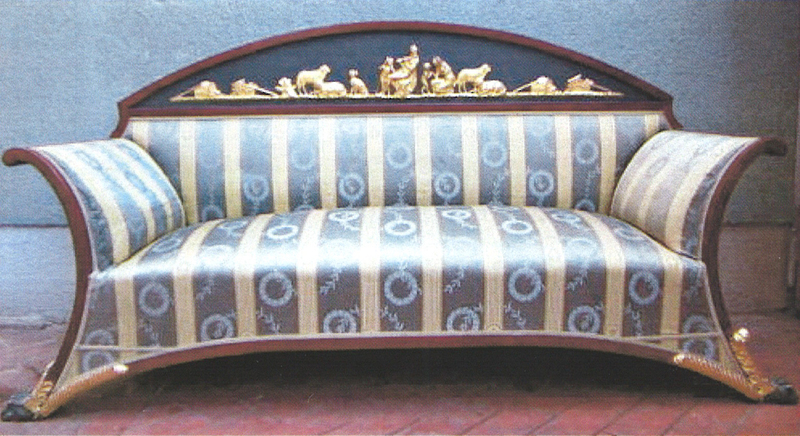 Mahogany veneer, gilding, reconstructed upholstery, 44 1/2 x 84 1/4 x 26 in. Milwaukee Art Museum, Gift of René von Schleinitz Memorial Fund, by exchange. Photo by John R. Glembin. Its outline is a curved rectangle, creating a simple, organic shape. Eventually, Biedermeier style furniture designers will pare away unnecessary decoration—all that gold decoration and fringed drapery—to expose the clean lines of the object underneath. Examples in the Museum’s collection that show this “high” Biedermeier style include a table, long case clock (shown above at right), and another settee. The Museum’s table and clock, in particular, show how important the grain of the wood becomes in Biedermeier furniture. The geometric planes of the furniture allow the beauty of the wood to be the focal point. This reflects an interest and celebration of nature in Biedermeier artwork. The clean lines look extremely modern to our eyes! And the orange settee certainly surprises. The arresting shape of the object—repeated, stacked volumes that mimic the cushion—looks straight out of the 20th century. The eye-popping color looks like a transplant from 1960. The color, however, is historically accurate. Color was all-important in the early 19th-century Biedermeier interior, due in large part to the publication of Theory of Colors by Johann Wolfgang von Goethe (German, 1749-1832) in 1810, which attached specific emotional responses to individual colors. Back to the transitional settee. It was designed by Josef Ulrich Danhauser (Vienna, Austria, 1780–1829) and sold by his company, Danhauser’sche Möbelfabrik (Vienna, Austria, 1804–1839). 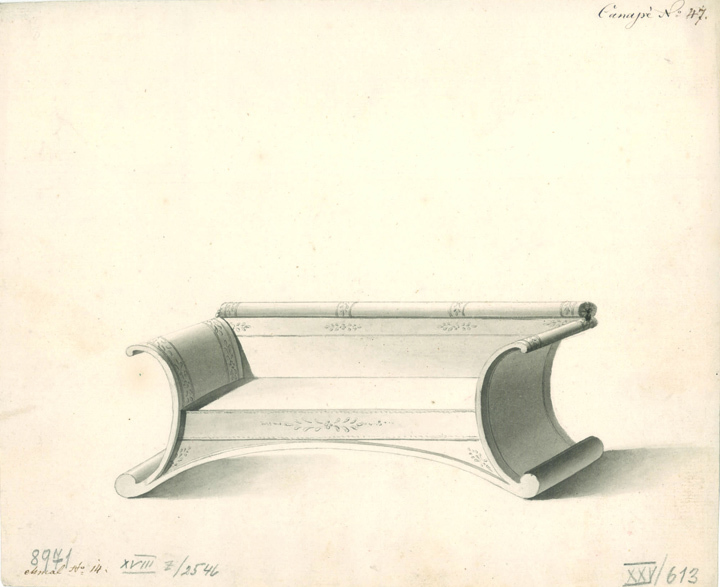 We know this because the MAK (the Museum for Applied Art) in Vienna has a collection of 2,200 drawings from the Danhauser’sche Möbelfabrik, and design number 47 (shown below) is the basis for Milwaukee’s settee. The Danhauser’sche Möbelfabrik was a type of factory that would produce standard furniture designs which could be personalized by the purchaser. Wealthy aristocrats, and eventually middle-class citizens, bought furniture for their homes from these types of designers, leading to a stylistic unity among interiors. Danhauser’s most prestigious and comprehensive commission was the refurbishment of Archduke Charles’s palace (today’s Albertina) around 1822. You can get a sense of one of his interiors from the Audience Hall. The “one-stop-shop” like Danhauser’sche Möbelfabrik for sets of furniture was a new concept in the early 19th century in Central Europe. Until this time individual craftsmen were part of individual guilds that controlled specific crafts; cabinet makers, wood carvers, metalworkers, and upholsterers would work on one piece of furniture, but not as part of the same business. In comparing the settee in the Museum’s collection with the drawing, we can see two key differences. One is the addition of the drapery. We know that this was part of the original upholstery, because during restoration the holes for the hardware were found. The recreation of the upholstery was based upon other Danhauser drawings that show drapery on furniture. Pre-restoration state. 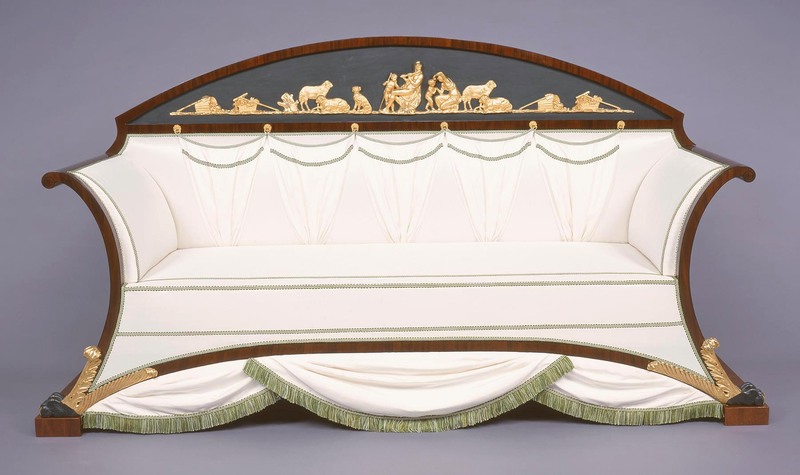 Josef Ulrich Danhauser (Vienna, Austria, 1780–1829), manufactured by Danhauser’sche Möbelfabrik (Vienna, Austria, 1804–1839), Settee , ca. 1815. Mahogany veneer, gilding, reconstructed upholstery, 44 1/2 x 84 1/4 x 26 in. Milwaukee Art Museum, Gift of René von Schleinitz Memorial Fund, by exchange. Photo by John R. Glembin. When the Milwaukee Art Museum purchased the settee in 2001, it was upholstered in a not-appropriate-at-all French-looking fabric, shown in the pre-restoration photo at right. The other difference is the figural decoration on the back. It shows a shepherd playing a flute, a herding dog, young boys, a girl, some sheep, baskets, and gardening implements. The same composition can be found on a similar settee in the National Museum in Cracow (Inv. IV-Sp-329) and a bed in the MAK in Vienna (Inv. H 3039). The MAK also has a Danhauser drawing of the bed with the figures shown on the headboard. It is thought that this pastoral subject matter (dealing with shepherds and the countryside) was a nod to the long tradition of depicting the pastoral in neoclassical art. During the Biedermeier period, this may also refer to the interest in nature and gardening. But this figural decoration holds another surprise. Dr. Renata Kassal-Mikula, a curator at the Wien Museum in Vienna, saw the settee at the Albertina when it was on display as part of the Biedermeier exhibition. She realized that the frieze has the same composition as a pediment decoration for the Cartoryski Palace, a summer home outside of Vienna owned by a string of nobility. Josef Ulrich Danhauser (Vienna, Austria, 1780–1829), manufactured by Danhauser’sche Möbelfabrik (Vienna, Austria, 1804–1839), Settee , ca. 1815. Detail of crest freize. Mahogany veneer, gilding, reconstructed upholstery, 44 1/2 x 84 1/4 x 26 in. Milwaukee Art Museum, Gift of René von Schleinitz Memorial Fund, by exchange. Photo by John R. Glembin. 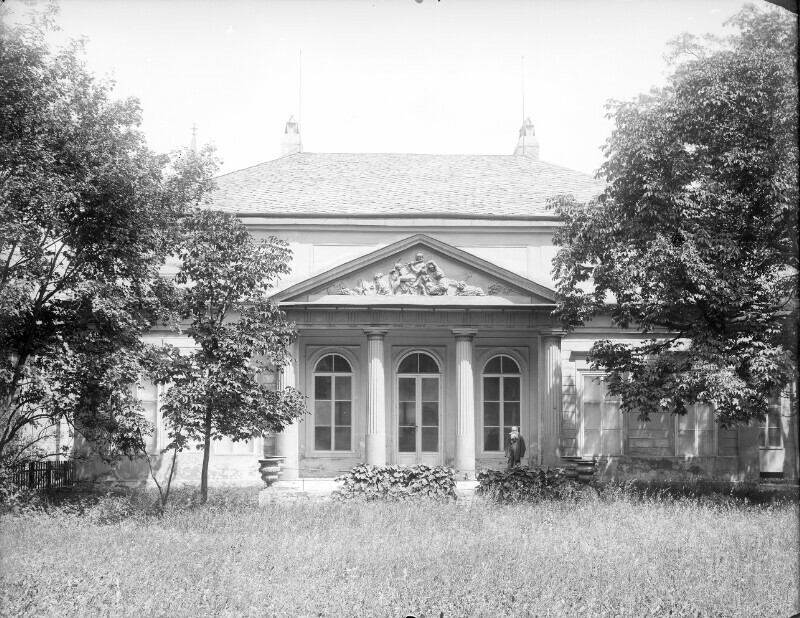 About 1810, the then-owner, a wealthy banker and grain merchant named Friedrich Jakob van der Nüll, reconstructed the house with four wings around an inner courtyard with classical portals. The pastoral scene was used on the portico for the garden façade. You can see an image of it here. The building has since been destroyed, but the Wien Museum has a fragment of one of the sheep in their collection. Dr. Kassel-Mikula knew that Van der Nüll owned an entire set of engravings by Francesco Bartolozzi (Italian, 1727-1815). This is documented in the entry from April 9, 1815 in Carl Bertuch’s Diary of the Congress of Vienna. Bartolozzi was a prolific engraver who left behind more than 2,000 images, including many copies of British paintings and illustrations for “The Shepherd” by James Thomson—a famous poem of the 18th century that featured pastoral scenes. Although we haven’t been able to pinpoint which Bartolozzi print was the inspiration for this shepherd, here is an example of the type from the British Museum. But the most exciting realization, as Dr. Kassel-Mikula concludes, is that Danhauser and his designers must have had access to a set of Bartolozzi’s prints. Either Danhauser owned it, or the person who commissioned the settee owned it and gave it to them to copy. In any case, this important discovery may have never been revealed if Milwaukee’s settee hadn’t traveled to Vienna for the exhibition for Dr. Kassel-Mikula to see! This entry was posted in Art, Curatorial, Exhibitions and tagged 19th Century Art, Biedermeier, Collection, Decorative Arts, European art, From the Collection, Furniture, German Art, Johann Wolfgang von Goethe, Josef Ulrich Danhauser, Vogel von Vogelstein. Bookmark the permalink.